My mother and I are craning our necks towards the big flat screen on the wall of her board and care home. We are watching a police pursuit weaving through the streets and freeways of Los Angeles. I know what is happening. She does not. I’ve just wheeled my mother back into the living room of the big airy house after our sidewalk excursion in this quiet neighborhood. She hugs one of the stuffed dogs I have given her. It’s a sun-shiny day. Memorial Day… And she goes along for the ride without mustering one ounce of drama or angst. This is not the mother I know. There she is smiling at the jasmine blossoms I snap off a vine and place in her out-stretched hands. She kisses her stuffed dog and looks up at the sky when I point to the little plane. But she’s happy to go back inside again and that’s where we watch the pursuit. Dementia is an interesting thing. I sing and play ukulele in memory care units for people who respond to a familiar melody or tap along with a steady beat. They smile and laugh sometimes. They scream and paw at themselves. Their stories are gone. Their histories—dropping, dropping precipitously into a heavy mist. But something is left. An essence. And I try to honor that and meet them where they are. 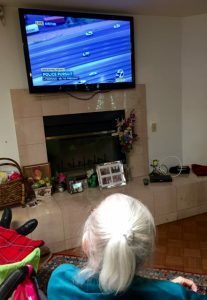 As we watch the erratic driver racing down the 105 freeway towards Los Angeles International Airport, Jinna, one of the caregivers, asks me if my mother liked to drive on the freeway. I chortle as memories of my mother unspool in my head like a really bad movie. My mother was a nervous driver, but as a passenger she could have won the Gloria Swanson Award for melodrama. She’d smash her right foot into the “imaginary” brake pedal on the floor. Never mind that she was in the backseat. But I could live with that. It was her screaming that scared the hell out of me. Blood curdling screams. I’d feel the adrenalin let lose in my body in classic fight-or-fright fashion. 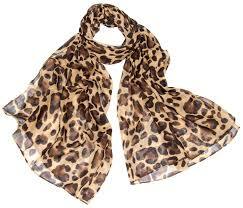 Once she agreed to wrap her favorite leopard scarf around her face so she couldn’t see. Or scream. But then she put her big-rim eyeglasses on, over the scarf, so “I don’t look strange.” By then “strange” followed her like day follows night. I tried to reason with her. “Mom! Don’t scream! It scares me when you scream. I’m not a good driver when I’m scared.” But my mother is a troubled woman. The Dr. Jekyll, Mr. Hyde type and playing the “reason game” doesn’t work. She tells me she can’t help it. And today I know that’s true because that is how mental illness is. When my mother was behind the wheel of her own car and another driver did something that pissed her off (which is casting a very wide net), her face went all Exorcist as she shouted “GO TO HELL…” Then she’d flip them off. I tell my mother it’s not a good idea to do that kind of stuff in Los Angeles. There’s that “reason” thing again. She’s lucky to be alive. Then something happened: Dementia. When my mother no longer knew what pills she was taking, we added Zoloft to her colorful array of capsules. It helps modulate her moods. Within two days she had morphed into a sweet old lady. Fricking Betty Crocker. The caregivers say she’s so nice. 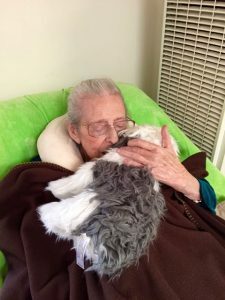 She smiles a lot, laughs, kisses her stuffed dog. It’s been a long hard road for my mother and me. How different things would have been between us and in all of her relationships if she had been taking Zoloft, or something like it, the last ten, twenty, thirty years. And now folks who meet her for the first time are enchanted. It’s an ongoing challenge for me to reconcile “my story” of my mother with what is true today. Like the people I work with in memory care units, I try to meet her where she is. YES, my mother was an angry and sometimes vindictive woman. YES, today she is mostly kind. YES, she has forgotten the people who were on her “hit list.” “I will destroy them,” she’d snarl. Red lights flashing. YES, she has forgotten I was on her hit list too. YES, her eyes get all sparkly when she sees me and we hold hands. What is true? All the above, of course. By now the crazy dude on television is driving south on the 405 Freeway. He will soon run out of gas and the police will throw cuffs on his wrists and haul him to jail. Thankfully no one else is hurt in this pursuit. My mother is napping in her Lazy-Boy, clutching her polyester puppy (that fortunately survived its first ride in the washing machine and dryer). So many memories. So many stories. And no answers. Except to trust this moment to shine a little light.